Varicose veins are twisted, enlarged veins, often dark blue in color, located near -or raised above the surface of the skin. They are often a symptom of an underlying condition called vein insufficiency. In healthy veins, one way valves direct the flow of vein blood in your leg upward, toward your heart. When one or more of these valves fails to function, the blood flows in the reverse direction causing the veins under the skin to engorge and distend. This “backup” of blood flow can increase the pressure in your veins to a level that is three to four times the normal flow. The high pressure then causes veins to bulge and stretch resulting in inflammation, pain and an unsightly appearance. Varicose veins do not suddenly appear. This condition usually takes years for signs and symptoms to develop. Many factors cause varicose veins. Although some causes are unknown, heredity and family history are common causes. Other contributing factors are age, obesity, leg trauma, pregnancy and activities and occupations that require you to stand for long periods of time. There may be other reasons for any one of the above symptoms, however, two or more of the symptoms at nearly the same time may be an indication of varicose veins or other vein disorders. Are there possible long-term complications? Varicose veins are common and are not generally associated with more severe health problems. However, they can be painful, unattractive and worsen over time. Varicose veins can cause legs and feet to swell, fatigue, and throbbing or cramping at night. The skin surrounding the veins may also itch and burn. In severe cases, venous insufficiency may develop, preventing normal blood return to the heart which can lead to problems like superficial thrombophlebitis or deep-vein thrombosis (blood clots). Spider veins are red and purple blood vessels that occur in patches on the legs. The network of vessels is often as delicate as a spider’s web, which is how they get their name. They can also resemble tiny sunbursts, branching trees or small lines on the surface of the skin. Linear spider veins are commonly seen on the inner knee, whereas the sunburst or cartwheel pattern often appears on the outer thigh. Spider veins (referred to medically as telangectasias) and varicose veins are not the same — and one does not necessarily lead to the other. Whereas, varicose veins are large, swollen and occur singularly on the legs, spider veins are delicate and tend to develop in clusters. They are, however, caused by similar factors. Spider veins can be caused by hormones and often increase during pregnancy. Although spider veins do not often produce symptoms, they can along with deeper feeder veins cause itching, burning and discomfort. Spider veins occur most often in women, although they are also seen in men. What are symptoms of spider veins? Typically spider veins cause itching, burning, aching and heavy legs that tire easily, with symptoms often worsening as the day continues. Relief comes with walking or elevating the legs. Yet there are many that experience no symptoms at all except for the unsightly appearance of the veins on their legs. How do I prevent varicose and spider veins? If you are genetically predisposed to them, you may not be able to completely prevent their occurrance. There are, however, some preventative steps you can take to decrease the likelihood of developing varicose and spider veins including: improving your overall health, excercising to help pump blood back into your heart – preventing blood from pooling in your leg veins, and maintaining a healthy weight. Varicose Veins are usually caused by a significant problem in the leg, so treatment is typically covered by most insurance companies. If you are unsure about coverage contact us to set up a consultation to evaluate your legs and we will guide you step-bystep through the insurance process. Will I need to be hospitalized or take time off from work? All of our procedures are outpatient treatments and are usually performed in our office. You will be able to walk immediately after the procedure, and will, in most cases, be able to return to work the same or the next day at the latest. Will I need to limit my activity after treatment? Your ability to resume activity depends on the treatment you receive. Some treatments may require you to postpone strenous activities for up to one week. Large veins may recur even after surgical procedures. Spider veins may also recur. It may seem that a previously injected vessel has recurred when in fact, a new spider vein has appeared in the same area. Any individual who has unsightly spider or varicose veins is a candidate, and both large and small veins can be treated effectively. Best results with spider veins are seen in fair skinned individuals. Tanning or prolonged sun exposure should be avoided both before and after treatment. The number of treatments to provide you with the results you want to achieve will be determined during your initial consultation session where a personalized treatment plan will be developed. For most large bulging veins, one treatment is all that is needed. 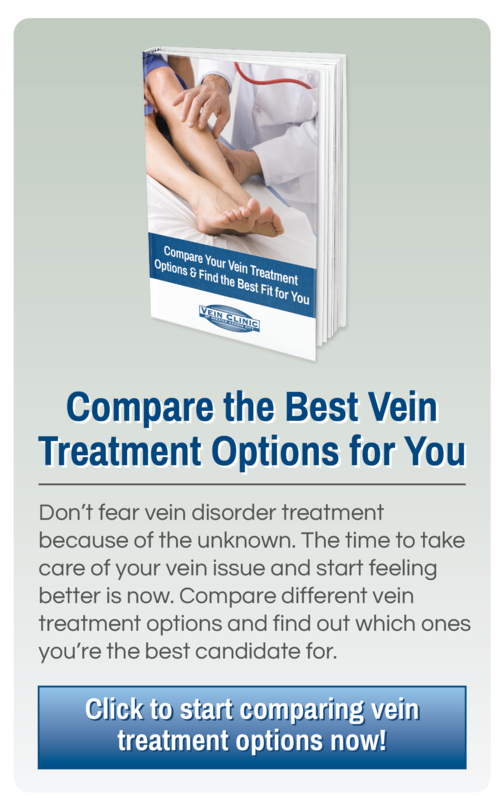 Spider veins do require several treatments. The average person requires 3-5 sessions spaced 4-6 weeks apart in order to get resolution. It depends on the type of treatment done. Endovenous ablation should take 2 hours and sclerotherapy should take only 30-45 minutes. It is important to note that multiple sessions will be required to completely treat your condition. Your doctor will have you come back every 6-8 weeks for sclerotherapy and this depends on the size and complexity your disease process.